This is excerpt No. 22 (of 45) from America’s Right Turn: How Conservatives Used New and Alternative Media to Take Power, by Richard A. Viguerie and David Franke. The 1960s saw the widespread conversion of Catholics from the urban Democratic machines to an increasingly Republican-based conservatism. Now, in the 1970s, it was the Protestants’ turn to mobilize politically and expand the reach of the Right. And they did it by using alternative media. Next came the 1980 election, with Ronald Reagan’s landslide victory over an incumbent president and the conservative siege of Washington. Seventy-five percent of the money for Reagan’s campaign was raised by direct mail, and behind that was the more than 1 billion pieces of conservative mail that had gone directly to voters in the preceding six years. Probably never before in American history had a political movement advanced so far in so short a period of time, and yet been so ignored by the establishment. No discussion of this era would be complete without recognizing the importance of the Religious Right in the expansion of the conservative movement. In the 1960s the conservative movement had benefited from the widespread conversion of Catholics from the urban Democratic machines to an increasingly Republican-based conservatism – largely over the issue of communism. Now, in the 1970s, it was the Protestants’ turn to mobilize politically and expand the reach of the Right. A number of issues spurred this development, but none was as important as the legalization of abortion with the Supreme Court’s Roe v. Wade decision in 1973. The Rev. 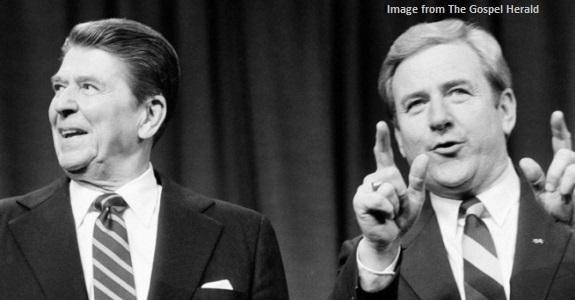 Jerry Falwell and his Moral Majority were the first to put the Religious Right on the map. Falwell is a Southern Baptist preacher who, almost from the beginning, used radio and television in his ministry – at one time his “Old Time Gospel Hour” was broadcast over as many as 500 radio stations across the nation. But its message was entirely nonpolitical – until that 1973 Roe v. Wade decision. Falwell determined that conservative and independent Christians had to get involved in politics – something most of them shunned, or at least kept separate from their religious witness. The Moral Majority was formed in 1979. Falwell hired Cal Thomas, now a top syndicated columnist, as moderator of his radio program and Bob Billings as the group’s first national director. When Reagan was elected president, he appointed Billings to the Department of Education in recognition of the support he had received from the Moral Majority, and Dr. Ron Godwin subsequently became the Moral Majority’s national director. Godwin had been associated with Falwell for years, traveling weekly from Lynchburg, Virginia (Falwell’s home base), to Washington, D.C., to attend the New Right meetings in Richard Viguerie’s home. “Dr. Falwell is what you’d call a self-made media figure,” Godwin told us. He got his message out to the nation through the aggressive use of alternative media. He did it by buying television and radio time, by the use of the news conference, by faxes, by e-mail, by special events in auditoriums and convention centers across America. And by direct mail. At our height we were probably the largest religious direct mailer in the country. We had some 500 employees involved, from the mailing house to the cash receiving and the data processing. As time passed, the fax machine came into active play. Even today, [Falwell] faxes his Falwell Confidential Report to almost 300,000 people, including almost 200,000 ministers. He’s turned the minister’s pulpit into a bully pulpit. Until Dr. Falwell broke the barrier, you almost never heard anything political from a conservative Evangelical pulpit. Today, on any given Sunday, there may be 50,000 churches where you’ll hear the pastor say something that he got from the Falwell Confidential Report or from Dr. Gary Bauer’s daily fax report. That’s as radical a change as the fundamentalist side of Christianity has seen in a hundred years. By the end of the year, they would all be whistling a different tune. The anomaly would soon morph into a threat to the civilized (i.e., liberal) world. For the next few months, though, only a few Washington political analysts took the movement seriously enough to investigate at the source. One of those analysts was the dean of Washington correspondents, the Washington Post’s David Broder. Broder paid a visit to Richard Viguerie full of questions, for he was mightily perplexed. This was years into the Carter presidency, when the Democrats also held an almost two-thirds majority in the House and Senate. Yet Carter couldn’t get his key proposals passed. Nothing was going through. Why weren’t Democrats able to implement their agenda? Broder had just talked to people in Vice President Walter Mondale’s office, and they had not been able to provide a plausible explanation. Perhaps Viguerie had a clue to unlock this mystery. And Viguerie did, as he explained how his direct mail operation was sending perhaps 70 million letters a year at that time, for conservative organizations, opposing Jimmy Carter’s initiatives. Broder was given the mandatory tour of the Viguerie computer room, housing thousands of computer tapes with the names and addresses of all those millions of conservatives on the mailing lists. Then came the 1980 elections. The New Right had targeted six powerful Democratic senators – and five went down to defeat, to be replaced by conservatives. In the House, the “Newt Gingrich class” of conservative candidates – about 35 of them – were sworn in as congressmen. More of the liberal media became interested in how this was happening under their radar (they hadn’t been alerted by the New York Times). But they still, for the most part, didn’t get it. Tom Brokaw, for example, interviewed Viguerie on his Thursday show following the November 7 election. Viguerie assumed they would be talking about the debut of the New Right, with all those new senators and representatives, but that wasn’t what interested Tom Brokaw. No, Brokaw whipped out Viguerie fundraising letters for two clients, congressional candidates (and brothers) Philip and Dan Crane. Two separate candidates but the letters were almost identical – how could Viguerie be that deceptive? The conservative revolution was beginning to triumph all around him and Tom Brokaw couldn’t see it. He didn’t have a clue. The biggest achievement of the 1980 election, of course, was Ronald Reagan’s landslide victory and the conservative siege of Washington. Seventy-five percent of the money for Reagan’s campaign was raised by direct mail, and behind that was the more than 1 billion pieces of conservative mail that had gone directly to voters in the preceding six years. The establishment media still didn’t get it, though, so Viguerie was again called upon to explain what had happened, this time it was one of the breakfasts regularly hosted by Godfrey Sperling, the chief Washington correspondent for the Christian Science Monitor. These breakfasts were for print media only – no electronic guys allowed. Then, out of curiosity, Viguerie asked to see the hands of the reporters present who had ever heard of the Rev. Pat Robertson. Only about two or three reporters’ hands out of 25 went up. Point made. Robertson at this time hosted the 700 Club on religious television and was on his way to becoming an 800-pound political gorilla, but they had no idea who he was. The establishment media guys obviously weren’t watching the 700 Club. They preferred to watch each other. It’s an incestuous practice still in vogue in Washington. Probably never before in American history had a political movement advanced so far in so short a period of time, and yet been so ignored by the establishment. The interesting thing about direct mail is that when it’s professionally done, it has a devastating impact. It’s like using a water moccasin for a watchdog – very quiet and very effective.